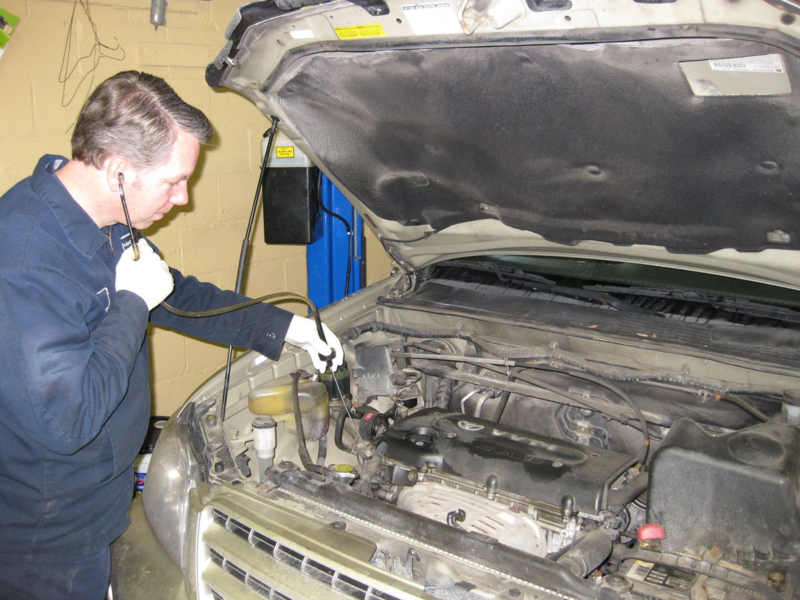 Finding and fixing vehicle noises are one of the most difficult tasks for our technicians. ASE Master Technician Keith Shelburne listening for engine sounds. Yes, we sometimes use stethiscopes to find noises. Sometimes, we can’t make the noise occur in the shop or on a test drive. Other times, we might hear a noise, but it isn’t the same one that our customer heard. Often, the customer who brings the vehicle into the shop to fix the noise isn’t the car’s primary driver, and hasn’t really heard the sound and can’t adequately describe it. So we’ve put together this simple guide to help you describe the noises your car makes. Following the tips we share below will save you time and money, and help us diagnose the issue faster. 1) Describe the kind of noise. Because your car makes so many sounds, describing the particular kind of noise it is making will usually help us locate the issue faster. Would you call it a rattle or a squeal? A thump or a hiss? A clank, a ping, a buzz, a scrape, a click, or a pop? Or something else entirely? Using specific terms like these to describe sounds will help us zero in on the noise and what might be causing it. 2) Notice when and how the noise occurs. If you can tell us when the noise happens, that will also help us re-create it here in the shop. And if we can hear it in the shop, our chances of finding and fixing the problem go way up. It usually happens once, and then doesn’t happen again for a while. It happens when starting the car; just after starting the car; when the car is cold; first thing in the morning. It happens when the car has warmed up; when it is hot outside. It happens when turning; turning left; turning right; turning sharply; going around curves. It happens when going over bumps or potholes. It happens when using the brakes. It happens when sitting at the light. It happens when cruising down the highway. The noise gets faster or slower (or louder or softer) as the car moves faster or slower. The noise is accompanied by a physical sensation – a vibration or bump that you can feel in the steering wheel or in your seat, for example. In addition to helping us replicate the noise, these details can give us important clues about what parts of the car might be causing the noise. 3) Make the noise for us. The more that you can tell us about the noises your car makes – what kind of noise, when it occurs, and what it sounds like – the faster that our team here at Lowell’s will be able to help. And we’re here to help!